A bathroom remodel may not be as overwhelming as a kitchen remodel, but there are still a lot of decisions that need to be made. Design, layout, and appliances are just some of the things that need to be considered. Even though they are usually the smaller room in a home, budgeting still comes into play when creating the bathroom you’ve always dreamt of! While there are many reasons to have a bathroom remodel done, one of the most common issues that influence homeowners to hire a professional remodeling service is having outdated countertops. If you have an older house, there may be a good chance that the bathroom countertops are outdated — we sure hope you aren’t stuck with the hideous pink laminate! Unlike kitchens, when selecting countertops for bathrooms you don’t have to worry about how it holds up to sharp objects, hot pans, and other wear and tear. However, when choosing new countertops for your bathroom you should consider choosing something that can withstand humidity, hot items — like curling irons or hair straighteners — and stains from cosmetics and other products. Just like kitchen counters, selecting bathroom countertops may be overwhelming. The design decisions you choose should be well-thought through as there are many types, styles, and colors to choose from. 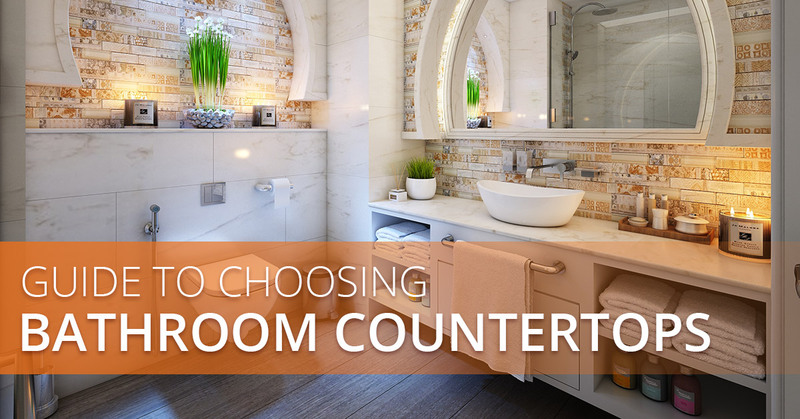 After years of experience in the industry, we know how difficult selecting bathroom countertops can be, so we created a brief guide to help make your decisions a little easier! Will the bathroom countertop blend or be the focal point? How much traffic and use does the bathroom experience? What style and type of sink will look best? What are the lighting needs? Quartz is a manufactured product that is durable and requires very little maintenance. Besides being a high-performing countertop material, Quartz looks beautiful and luxurious. Quartz countertops are a popular choice for bathroom remodels when it comes to durability and bold color selections. Granite is a natural stone which makes granite countertops a great choice for color, design, and durability. Unlike other countertop surfaces, granite comes in a wide selection of color choices that are created naturally. When you choose granite countertops, you’re getting something unique as no piece is the same. If you want the countertops in your bathroom to be a focal point, bold granite is the way to go. If you’re looking for your countertops to blend more, perhaps a quiet and neutral pattern of granite is the best choice. Either way, granite countertops are a sensible choice for easy cleaning and durability. As another natural stone, marble is a great option for bathroom countertops. Marble countertops come in a variety of colors and styles, from the traditional white and grey marble with dark streaks to the classic travertine that boasts is earthy tones. Marble countertops are a timeless classic option for your bathroom! Decoran is a locally manufactured, solid surface, countertop material that is stain resistant and chemical resistant. Sinks and backsplashes in bathrooms can be seamlessly integrated into the countertop. Decoran countertops make a great option for bathrooms as they offer durability, quick and easy maintenance, and seamless joints. Contact FiberPol For Barbados Bathroom Remodels! As you can see, there are a lot of options available for bathroom countertops. If you’re considering a bathroom remodel in Barbados, contact the countertop experts at Fiberpol! As Barbados best remodeling service, we carry a wide selection of modern and trending countertop styles that will look great in your bathroom. For more information, or to schedule a free consultation, contact our remodeling professionals.